This is a minimalist poster I created in my 14-week Adobe Illustrator project group. In this class we discussed design techniques and learned how to navigate the program. Our final project was to create a minimalist poster for a book, movie, or music album. 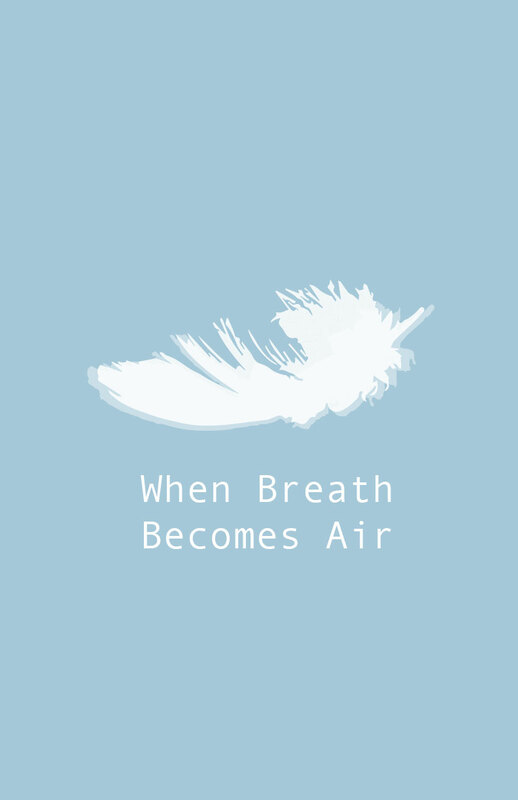 I chose to make a poster about the memoir When Breath Becomes Air by Paul Kalanithi. As cliche as it sounds, I absolutely cannot believe how fast my freshman year has gone by! I have formed many close friendships, learned so much, and had amazing experiences to last a lifetime. In terms of H&S G.O.A.L.S., I have had unique experiences in each area. Please read about these experiences in my G.O.A.L.S. category! I’m excited to announce I will be teaching a brand new digital sandbox project group for Media, Marketing, and Communication Scholars on Professional Writing and Public Relations! MMC project groups are open to any H&S students, so I encourage students to take advantage of these awesome opportunities. The Professional Writing and Public Relations project group will be co-taught by me and my fellow MMC’er, Devon. We are looking forward to bringing this idea to life for the first time! It will be held on Mondays each week at 1:50pm in Morrill Tower’s MMC Office weekly starting August 27th. This year I have worked to increase my sense of global awareness, and Ohio State’s diverse opportunities have made it easy to learn about different countries, ideas, languages, and cultures. Living in Morrill Tower, three of my suite-mates are international students from China. I have thoroughly enjoyed getting to know them and hear about their stories. They even made hot pot for dinner for us one time, so it was neat getting to try food that they regularly eat back home. One of the coolest events I’ve been to all year was Taste of OSU. There were many dance performances and tons of delicious food! I got to see my friend Lauren perform with the Japanese Student Organization, and my friend Lisa performed with the Irish Dance Team. The best dish I sampled was traditional Polish pierogis! 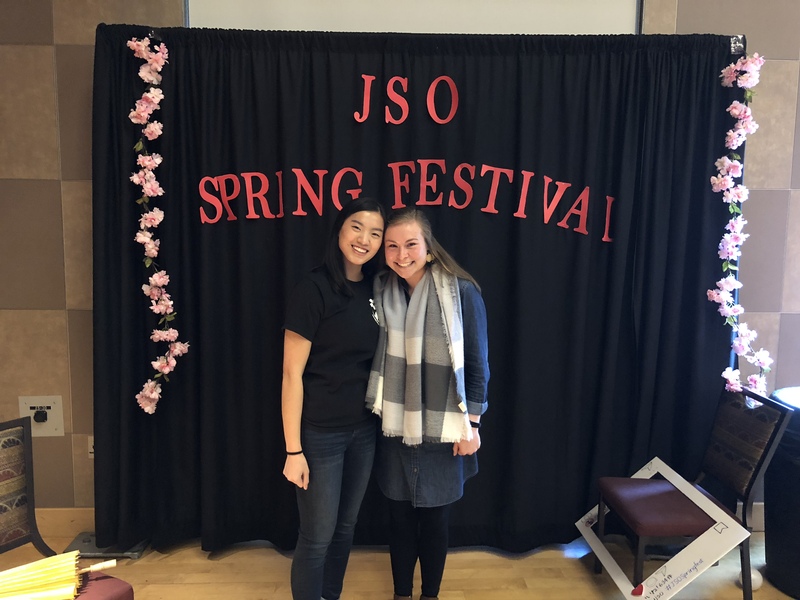 Recently I attended the Japanese Student Organization’s 13th annual Spring Festival. I tried mochi, a Japanese dessert similar to ice cream. My roommate Lauren showed me how to write Japanese characters in traditional calligraphy. Through these experiences– and many others– I have been able to learn so much more about the diverse world around me! My roommate Lauren & I at the Japanese Student Organization Spring Festival! I am pleased to announce that I’ve accepted an internship with the Leukemia Lymphoma Society in Cincinnati for Summer 2018. This internship will be focused on Marketing and Communications, and I hope to help with their big campaigns and events. I cannot wait to develop my writing skills and to learn what I’ve applied in my classes in the real world. I’m excited to work for a nonprofit like Leukemia Lymphoma Society who does amazing work to raise money for cancer research! One of the most enriching service activities I’ve been involved in this year is through the Catholic church on campus, the Newman Center. I’m very involved in the Catholic ministry on campus and loved getting to go on the fall retreat, Buckeye Awakening 17. I applied to help staff for the next retreat, Buckeye Awakening 18, which took place recently. Being a volunteer on this retreat, I think I got more out of it than when I was a retreater. It helped me appreciate how much work goes into putting together an event like this. I enjoyed getting to serve even in the small ways like setting up PVC pipes to display our banners and directing retreaters where to go. I can’t wait to volunteer on more Buckeye Awakening retreats and serving in many other ways through the Newman Center. This is my current resume. Instead of deleting my previous resume from September 2017, I chose to keep the post so that I can go back and see how my resume has grown and evolved. I recently wrote a blog post about Buckeye men’s hockey against TTUN. It was such a fun game, and I loved being able to write about my experience. Check it out! As a Strategic Communication major, I love to write. This year I have enjoyed writing for Buckeyes Blog, which Ohio State University marketing department uses to recruit undergraduate students. This is my bio as it appears on Buckeyes Blog. Even though it’s only my first year at Ohio State, I’ve had many opportunities to grow and develop as a leader, and I’m excited to continue these opportunities and build on them in the next couple years! MMC FLO: As a member of Media, Marketing, and Communications Scholars, I am also a part of our freshmen leadership team (FLO). I’ve learned a lot about working as a team, planning events, and managing a budget through this experience. My favorite event from this year was our Professional Development evening when we had two faculty from the College of Arts and Sciences Career Services. They helped us with resume editing, interviewing skills, and navigating LinkedIn. I look forward to continuing to plan social and professional events for MMC sophomores next year. The PRactice Account Executive: The PRactice is Ohio State’s student-run public relations firm that gets to work with real clients. Spring semester I’ve been serving as an Account Associate for our client Car, the Center for Automotive Research at Ohio State. They are also known as the Midwest Hydrogen Fuel Cell Collaborative and are dedicated to researching and developing sources of clean energy using hydrogen. Through this experience I have learned a lot about interpreting social media analytics, creating content calendars, and working on a team. Next year I am excited to take on a leadership role as Account Executive with the Youth and Technology Minor. PRSSA Alumni Relations Subcommittee Chair: I joined PRSSA (The Public Relations Student Society of America) fall semester and have loved the opportunities this student organization has offered. Since I’m a freshman who is only in intro-level Communication classes, PRSSA has helped give me a good idea of what the field of Communication looks like and what potential job opportunities I might have in the future. I have personally gotten a lot out of PRSSA’s professional mentorship program and wanted to get more involved with the club and their connections to alumni. I am excited to serve as the Alumni Relations Subcommittee Chair next semester!